Today, Business to Arts and Allianz launched the call for nominations for the 2018 Allianz Business to Arts Awards which celebrate the unique opportunities that business engagement with the arts provides. At the awards launch, Business to Arts and Allianz encouraged businesses from across Ireland to deepen their relationships with the cultural community and create meaningful partnerships which benefit the arts, business stakeholders and the Irish public. Previous award winners include Accenture, ESB, Bord Gáis Energy, Dublin Port Company and Bank of Ireland. This year marks the 27th anniversary of the Allianz Business to Arts Awards and Allianz’s 18th anniversary of involvement and sponsorship of the awards. Allianz is encouraging the business community to become involved again this year and to support and celebrate creative talent across Ireland. There are 10 categories in total focusing on sponsorship, commissioning, CSR initiatives and community engagement as well as mentoring, training and staff programs. The online application form can be accessed through www.businesstoarts.ie/awards. This year also sees the 11th year of the €10,000 Jim McNaughton/TileStyle Bursary, which is open to emerging artist(s) in any art form. 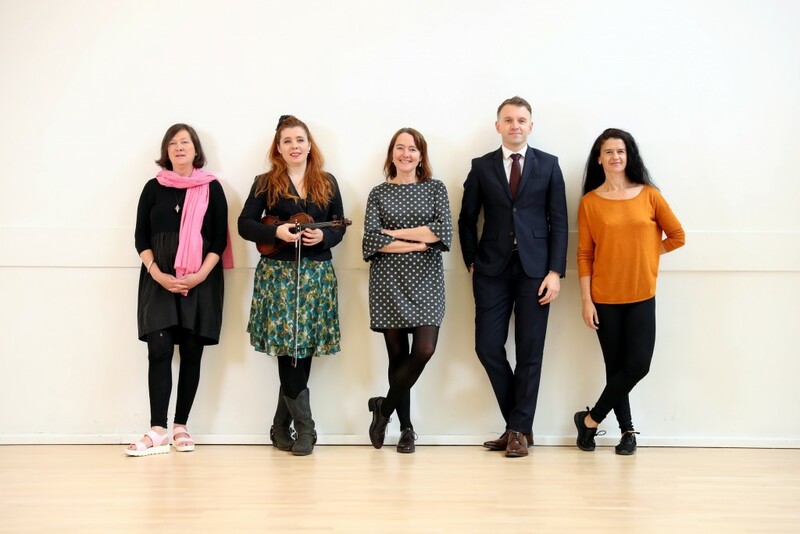 Previous winners include Irish Times Irish Theatre Award nominee Clare Monnelly (theatre), pianist Máire Carroll (music), ballet dancer Gearóid Solan (dance) & sculptor Alva Gallagher (visual art). It is with great sadness that Business to Arts writes this appreciation of our friend and former Chair, Dermot Egan. Dermot died on 16 December 2017. While working with AIB, Dermot convened the very first meeting of Cothú – The Irish Business Council for Arts & Heritage (now named Business to Arts) in February 1988. 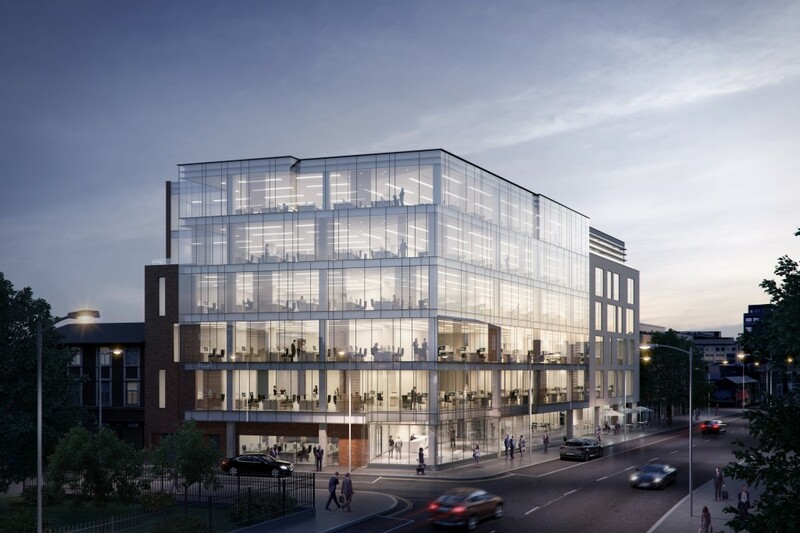 He did this with a group of peers from a mix of Irish companies including Bank of Ireland, Irish Shell, The Jones Group, Aer Rianta, Coyle Hamilton and Clancourt Investments. By August 1988, Cothú was established as a membership-based charitable organisation. 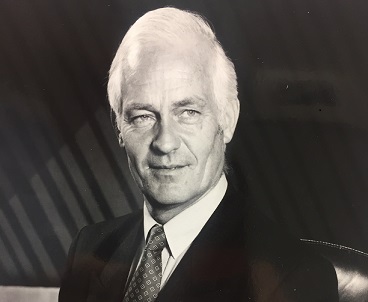 Dermot was inaugural Chair of Cothú from August 1988 to December 1993. During this time he was heavily involved in the establishment of the National ‘Arts Sponsor of the Year Awards’ (now named the Allianz Business to Arts Awards). He was also Cothu’s first Honorary President from December 1993 to December 1996. He was presented with a Life Fellowship of the Irish Management Institute in November 1996 and in 1997 Dermot was recognised by his peers for his seminal role in the establishment of Cothú. Dermot was also a Chair of the National Concert Hall (serving as a NCH board member between 1996 – 2011) and a non-executive director of Wilson Hartnell. On behalf of all involved with Business to Arts we extend our sympathy to his wife Noreen and her family. You can read a little more about Dermot Egan here. 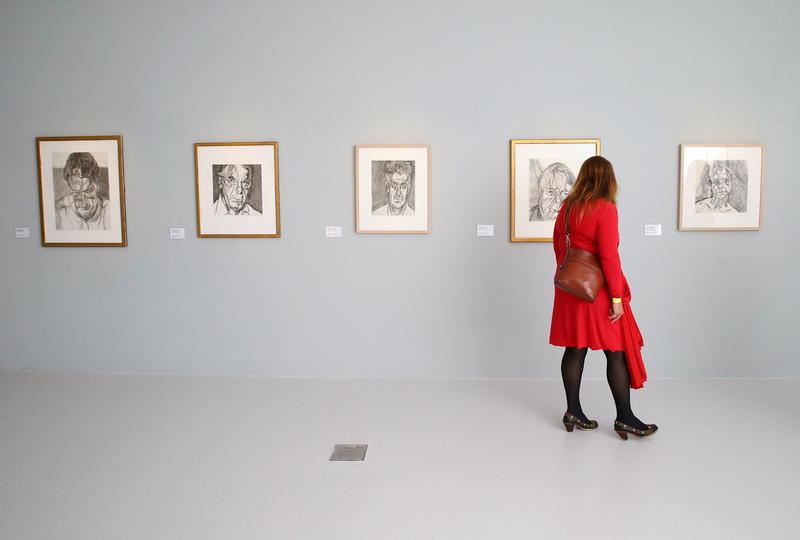 Business to Arts are delighted to announce RCSI’s open call to artists for a series of new portraits of historical female leaders in medicine. Women on Walls at RCSI in partnership with Accenture will recognise the pioneering achievements of a group of extraordinary women and enhance the visibility of historical female leaders in medicine. The new portraits will be hung in the Board Room of RCSI’s historic building on St. Stephen’s Green. Speaking ahead of the announcement, Professor Cathal Kelly, RCSI CEO said: “Gender diversity is core to our ethos at RCSI and we are proud to be associated with women who broke boundaries to become leaders in medicine. (Emily) Winifred Dickson, for example, became the first female Fellow of RCSI in 1893, making her the first female Fellow of any of the surgical Royal Colleges in Britain and Ireland”. “Women on Walls at RCSI in partnership with Accenture will bring the legacy of these women to life, providing a platform to celebrate their contributions and raise the visibility of the role of women in medicine. 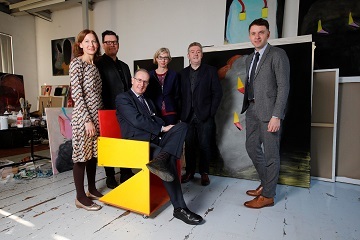 We are delighted to be working with Accenture and Business to Arts on this important campaign and we look forward to seeing the completed portraits hang in our historic St Stephen’s Green building”, added Professor Kelly. Artists are welcome to submit a proposal to Business to Arts before 5pm on Wednesday, 25 April 2018. It is anticipated that the successful artists will be selected in June and that the completed artworks would be launched in Spring 2019.
Business to Arts and financial services law firm, Walkers, have today announced Irish photographer Kate Nolan as the Walkers Photographer-in-Residence under the Docklands Arts Fund. This new and unique residency sees Kate work with transition year students at CBS Westland Row and Walkers staff to develop their creativity and photographic skills. Kate Nolan is an Irish visual artist based in Dublin. Drawn to “in-between” places, she is intrigued by the effects of shifting histories of areas in flux. Nolan collaborates with local communities over extended periods to give voice to these changes through the combination of their stories and her images. Through her work, she begins to highlight the latent contradictions and tenuous relationships between political borders and cultural identity. Nolan’s work has been featured in a wide range of photography publications and she has exhibited in solo and group shows in Ireland and internationally. Her work is held in public and private collections in Japan, USA, France, Portugal, Mexico, UK and Ireland. The residency includes a series of workshops, where Kate will introduce documentary photography to CBS Westland Row transition year students through ‘story walks’ of the Docklands. These workshops will be led by the students themselves, who will select the locations to be photographed. Each week students will explore a different theme, visually strategising their stories through photographic walks of the Docklands. On these walks, students will learn new technical skills and aesthetic decisions. The images created will be brought back to the classroom to discuss and combine with text. 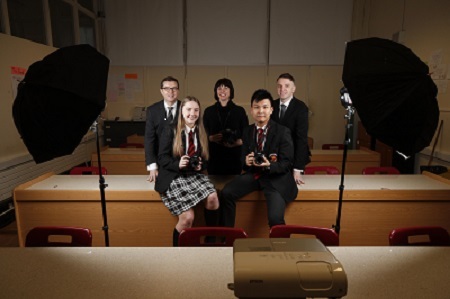 The aims of these workshops are for students to learn photographic technical skills, how to read a photograph and then be able to tell their stories through imagery. Following a public recruitment process, we are very happy to announce that Michelle Reid has been appointed to the position of Arts Programme Manager. Michelle has been Project Executive at Business to Arts since mid 2017 and has worked across a variety of our projects including Fundit.ie. She will commence her new role on December 18 2017. Michelle’s previous experience spans 10 years of professional conference and association management. 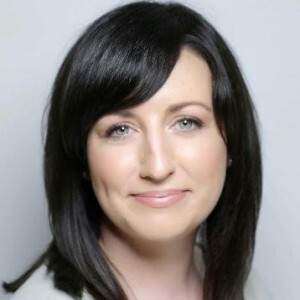 Having worked in Berlin, Abu Dhabi and Dublin, Michelle has extensive experience in international and domestic events covering sectors such as technology, healthcare and culture. Michelle’s expertise lies in client account management, programme management, as well as event production. 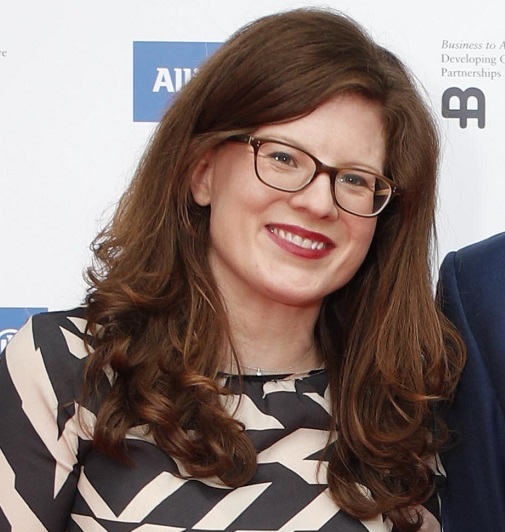 Michelle is a recent graduate of University College Dublin with a Masters in Cultural Policy and Arts Management (2017), having previously obtained a Bachelor of Arts in Business and Politics from Trinity College Dublin (2006). She trained in TV Production, Directing and Presenting at Park Studios and also holds a Professional Diploma in Digital Marketing from the Digital Marketing Institute (2016). To read more about Michelle see her profile on the about us section of our website and on linkedin. 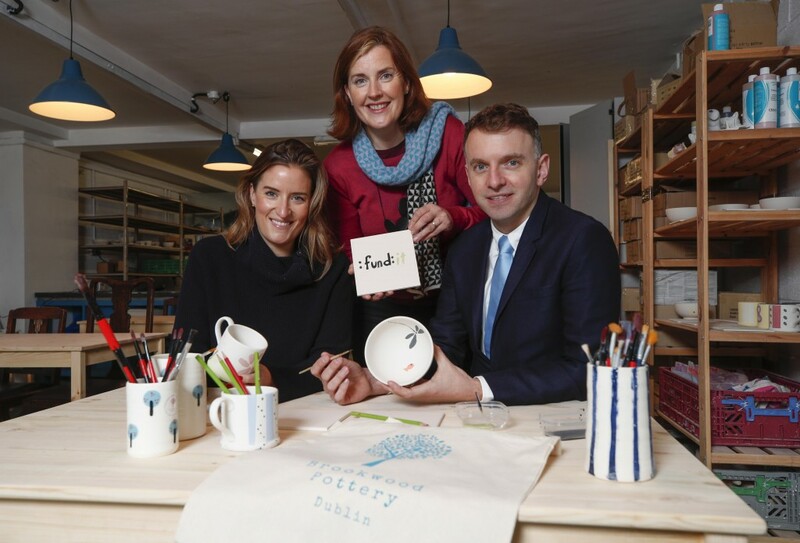 Lesley Tully, Head of Design Thinking, Bank of Ireland and Andrew Hetherington, Chief Executive, Business to Arts & Fund it with Elaine Fallon, founder, Brookwood Pottery at the newly opened Brookwood Pottery studio. Picture Conor McCabe Photography. Today, Bank of Ireland & Fundit.ie celebrate their two-year partnership with the announcement of three new project categories. Project creators will now be able to submit projects focused on enterprise, environment and heritage. To date, over 1,400 projects have been pledged to on fundit.ie. 2017 has seen the Fundit.ie team complete the latest phase of technological developments to the site, including site redesign and faster submission and launch processes for creatives and entrepreneurs. Over the last 6 years, Fund it has firmly established itself as Ireland’s leading reward-based crowdfunding platform. Having attracted pledges from 66 countries, global funders across every county in Ireland have been funded. Over 70,000 people have funded Irish performances, technology, films, events and projects in music, art, fashion, publishing, tech and gaming since the site launched in March 2011. In 2017, Paschal Cassidy, along with a volunteer committee, ran Fund it’s most successful project to date, successfully raising over €32.5k through 454 pledges to save the Ballyglunin train station, better known as ‘The Quiet Man’ train station from dilapidation. Apart from raising the highest target for a single project, Paschal garnered the support of celebrities such as Liam Neeson and Gabriel Byrne. To celebrate the final 2017 ‘Fund-it Wednesday’, Bank of Ireland and Business to Arts are hosting a special event at the Bank of Ireland Workbench on Grand Canal Square where a number of previous project creators will speak about their crowdfunding experiences including musician Shane Hennessey and Brookwood pottery studio owner Elaine Fallon. This lively discussion session aims to give insight into all you need to know about crowdfunding as an alternative way to unlock funds for a start-up through engaging with your customers, friends or social media followers. Briefly describe your activities with your main corporate sponsor. Why do they work for GIAF? How have you developed them? Our sponsorship offerings are bespoke – we work out the objectives with each sponsor and work out tailored packages to suit their needs. The partnerships have to be win-win and we always try to develop relationships that go beyond the financial to deliver more for both parties. We have been lucky in that sponsors have allowed us avail of their superior marketing skills and intelligence e.g. Ulster Bank have given us access to their web designers, who came in and critiqued the GIAF website and are now watching it to see how it’s functioning and seeing how people are using it. 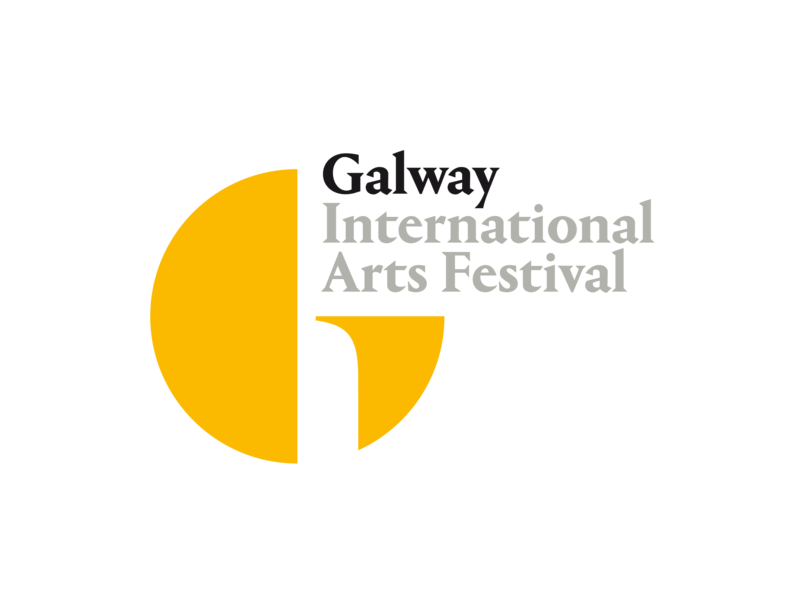 GIAF is considered a strong sponsorship rights-holder, what do you think makes GIAF a leader? Would you ever compare yourself to other arts organisations? We look at other sectors for comparisons, for example sport and large-scale music. When you look at the research, Rugby is consistently at the top. They do sponsorship so well that they’re almost too congested. What business objectives are you seeing from your sponsors, and how do you report on the impact the relationship has had on meeting these needs? Sponsors are looking for solutions to business challenges such as sales, customer retention, customer perception, relationships with businesses and/or the community. For 2-3 months in advance of the festival, we would have a lot of direct contact with key sponsors to insure we are where we should be. Post-festival we report on our impact usually with a presentation or review document that contains the key metrics that are of interest to our sponsor. This review process usually happens between September and December. What structure do you have for managing/maximising these relationships internally – do you have a dedicated team/staff member? Hillary Martin is our Communications and Development Manager, so together we manage the sponsorship relationships. Bringing someone on whose sole role is sponsorship relationship management will be the next stage. What are the major barriers/obstacles you face with developing your sponsorship portfolio? To be honest, securing sponsorship is up to us. If we don’t succeed with a proposal, it’s because we weren’t attractive enough or the timing is not right. I think people are listening in the market at the moment and the environment has got much better in the last few years. I do think that the more traditional sponsorship agreement is disappearing. There is more depth in relationships now, which I think will be better for cultural organisations in the longer term. If you are unsuccessful with a sponsor, if you ‘weren’t attractive enough’, do you change your offer, or do you just see it as not the right fit at the right time? You would always try to get feedback as to why it didn’t work. But you can just be unlucky and be presenting at the wrong time for a company’s plan. In one case, I was three years too early. The last sponsorship I got in, at the end of the agreement email it said ‘timing is everything’. You may end up with a partner you never thought you would have or a potential partner you thought would work does not work out at all. Do you have a minimum lead-in time for any potential new sponsor that you’re approaching? It depends, but in general I think you need somewhere from a year to two years approx. You need to develop an awareness of the company’s needs and how the company operates. Particularly in very big organisations, you need to figure out what their challenges are and then how the various departments within the company relate to one another. There is a certain amount of time required to developing and refining your proposal and then time for the company to respond to it. There hopefully then follows a series of meetings where ideas are progressed and then finally an agreement gets over the line. In what ways do you feel more corporate sponsors could be attracted to cultural sponsorship in Ireland? I think sponsorship for the arts is about case building over time. That’s where I see Business to Arts coming into it. People need to get comfortable with the notion of it. They are very comfortable with sport because most of the people who make the decisions are probably comfortable and interested in sport and know a lot about it. The other thing to remember is brand. People sponsor brands. Briefly describe your activities with your main corporate sponsors. Why do they work for IMMA? How have you developed them? We have four main multi-year sponsors – Goodbody, Matheson, Hennessy and The Dean Dublin. They each work with us in very different ways and each support different elements of the programme. Hennessy support the purchase of new Irish work for the IMMA Collection, Matheson support the production of new work at IMMA, both Irish and International through commissions, workshops and exhibitions; Goodbody support IMMA 1000; which is a fund that supports our work with Irish artists through residencies, acquisitions and commissions, and The Dean Dublin are our hospitality partners giving us a home from home to host artists, curators and other supporters. We also work with Credit Suisse and BNP Paribas as the ‘Freud Circle’ to specifically support the Lucian Freud works at IMMA; a landmark resource of fifty art works for Ireland on loan until 2021, and our major events partners O’Hara’s Irish Craft Beer – an excellent independent Irish company who support hospitality at our openings and events. IMMA is considered a strong sponsorship rights-holder (based on Business to Arts research for the Arts, Festival and Music Sponsorship Summary Reports), what do you think makes IMMA a leader? The sponsorships are successful from an arts point of view because all of our partners are genuinely bought into our vision and want to support Irish art and artists. Our sponsors trust that IMMA is making the right decisions, and are not seeking to dictate or input to artistic programming. We won’t compromise artists and their work and our sponsors have a mature understanding of that. When prospecting for sponsors, we really sought out that quality – looking for partners that aligned with the programme, not aligning the programme to sponsors. They are all forward-thinking companies who really understand the value of contemporary artists to a thriving and mature economy. When developing an offering, we look at certain things we want to do in the programme, and see what areas might be suitable for a partnership. Based on the opportunity, we determine what kind of company are we looking for – what sector/company might be interested in it. For example, when looking at our youth programme, we need to ask if branding is suitable, and if so, what kind of products/companies are the right fit. Different partners have different needs and different ways of measuring their relationship. For some it is primarily a CSR based relationship, for others an internal branding piece to staff and clients and for others still it’s an external branding piece. We work with each partner to try to establish what success looks like for them and set targets together that make sense for the partnership. 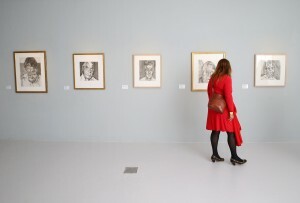 This varies from the number of events held at IMMA, to the number of staff engaging with IMMA activities, to press mentions, number of artists supported or number of brand recognition opportunities realised. What type of reports do you generate – soft/metrics/etc. and how often? They’re all different, so it’s about finding their priorities to relay back in the report. In the pitching stage, the company is interested in demographics, but once they’re on board that audience info is a given, so they’re less interested in the demographic details. For retail brands its often press mentions or brand recognition so press reporting/media monitoring that is key– if the partner has a media /PR company we know that’s a priority. Generally companies have their own media monitoring service and then we produce a visual report of all the times the logo was used. This is particularly useful over multi-annual relationships where branding can be taken for granted as it rolls out. Business to Business companies are often more interested in how their support is relayed to our donors and stakeholders rather than in blanket brand exposure to the entire audience. There is responsibility on both sides to be clear about what the priorities are. It can seem daunting to do that, for fear of getting it wrong, or being tied into something onerous, but actually if you don’t capture those deliverables straight-on you waste time second-guessing what might be needed, running the risk of focusing on an area that is of interest to you, but not to your partner. The frequency and scale of reporting can sometimes be determined by what the partnership value really means to them for their budgets. An amount that makes a huge difference to our budget may only represent a small % of their marketing budget for example. We usually report in detail every year, with a mid-year update and regular (quarterly) reviews. I’m the Head of Audiences and Development, and my department encompasses the Fundraising team and the Communications team. We also work closely with Visitor Engagement and our Programming colleagues, all of whom are vital elements in supporting a successful corporate partnership. Within the Fundraising team there is a dedicated Corporate Officer who works closely with me to maximise the benefits of corporate relationships for our partners and service those partnerships effectively. To my mind marketing and development are intrinsically linked, so it makes sense that they sit in the same department. If you don’t have a strong brand, you won’t build strong relationships. If you’re talking about true, long-term partnerships, they’re looking for a clarity of vision and mission, and the brand must be one they want to attach their company to and can derive value from. Having an awareness and understanding of the partner organisation, makes the initial contact much more streamlined. Time and resources. Servicing a successful partnership takes a lot of human resource time and we are a small team. We have a portfolio of significant sponsors, and each relationship takes a lot of resources to maintain. No. It very much depends on the scale of the ask. A significant multi-year partnership takes time and understanding and can take over a year to develop. Smaller partnerships, or those that are focused on support in-kind, can happen much faster – in 3months or so. We are generally led in our timelines by print deadlines or deadlines around recognition opportunities. It also very much depends on the time of year and the budget planning cycle for Corporates. For those shorter lead-in relationships, how do you make the approach, is it companies you already work with, or do you just look at suppliers for what you need? Yes, we usually look at organisations that are known to us, or that we have a specific need for, to support with expertise and product/services. Connections might come from the production department – dor example we partnered with a Swift Scaffolding for a really ambitious outdoor project A Fair Land last year, because we needed their expertise as well as their product. It was a great opportunity for their staff to learn and gain new skill and I think they were interested in partnering with us as an opportunity to work in an unusual way; to stretch their own skills. Those kinds of relationships are often quicker to close because there is part payment, part in-kind products or expertise. We can be clearer about our vision and mission as organisations – why we do what we do and how it impacts on the society we live in. We can segment our offerings better. We can be more empathetic of the corporate day-to-day and what they need. The arts organisation needs to understand speak the corporate language, and vice-versa. At a societal level, there could be a better understanding of the benefit of corporate relationships. To be confident in the vision that you have, to look for the right relationships that will work, and to have pride in those partnerships. The lack of media focus, and mature conversation about the work that’s being done is part of the challenge. Simple things like media dropping a sponsor’s name from a project title if they don’t understand the importance of the relationship can be very damaging, to the need for more complex discussions about how arts are funded in this country and why companies might find value in those relationships. 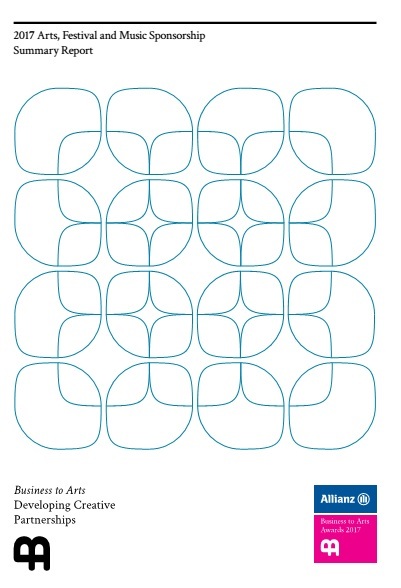 This is the third Arts, Festival and Music Sponsorship – Summary Report produced by Business to Arts and Allianz. With this report, we provide an overview of the data, trends and sentiment captured via the annual Allianz Business to Arts Awards process. The Report adds an additional layer of insight and analysis for sponsors and those seeking sponsorship. It also assists with our advocacy work and objective to develop sponsorship in Ireland. Of the sponsors surveyed, 95% say that their sponsorship spend will either remain the same or decrease in 2018. The data analysed reflects the subdued business sentiment in Ireland, concerns about Brexit and the impact of a weaker pound on business in Ireland in the coming years. Among this year’s winning and highly commended entries, there are partnerships that demonstrate excellence in consumer reach and awareness. In this regard, Bank of Ireland Junk Kouture provides an excellent case-study. 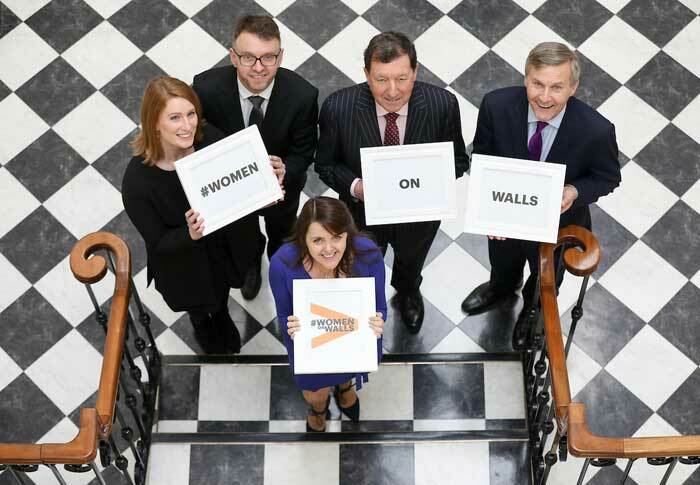 A significant percentage of respondents this year identified Accenture’s ‘Women on Walls’ campaign with the Royal Irish Academy as a ‘best-practice’ partnership in terms of commission-processes, activation campaigns and PR value. 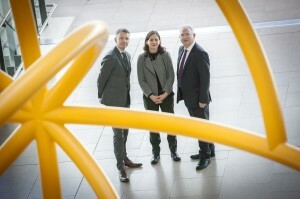 Overall awareness of Accenture’s sponsorship of the arts among those surveyed was high. ESB / Electric Ireland and Bord Gáis Energy followed closely. Among arts, festival and music rights-holders, Galway International Arts Festival, IMMA and Dublin International Film Festival are identified as leading the sponsorship-seeking field. This year, we welcome the Public Relations Institute of Ireland to provide external observations on this report. Should you need added layers of insight about arts, festival and music sponsorship, please don’t hesitate to contact us. Visual artist Martina Galvin, musician Imogen Gunner, writer Catherine Ann Cullen & choreographer Monica Munoz with Andrew Hetherington, Chief Executive, Business to Arts at DanceHouse on Foley Street for the announcement of the recipients of the 2017 Small Grants scheme. 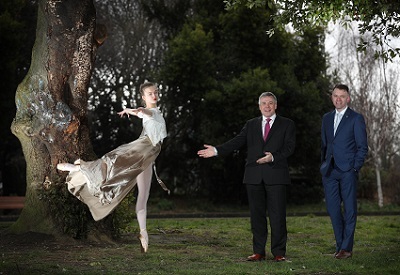 Today, Business to Arts announce this year’s recipients of the Small Grants scheme under the Docklands Arts Fund. 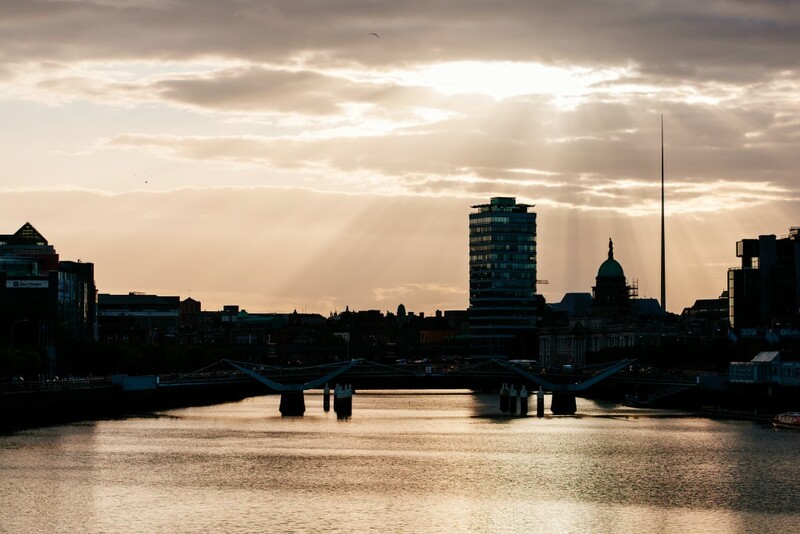 Working with Dublin City Council, the objective of the Docklands Arts Fund is to enhance and develop the appreciation of quality art experiences in the Docklands area. Martina Galvin (visual artist), Catherine Ann Cullen (writer) & Imogen Gunner (musician), and Monica Munoz (choreographer) will receive €5000 for each of their projects, which will be based in Dublin’s Docklands over the next year. The Docklands Arts Fund, is a partnership between Business to Arts, Dublin City Council and local businesses and individuals. In 2016/2017, 77 people supported the Docklands Arts Fund through donations of cash and proceeds from the sale of the annual Docklands Arts Fund Print Commission. • Martina Galvin is a visual artist, and her project ‘Coastlines, Maps and Melons’ is a visual art engagement with 3 schools in the Docklands Area. The project will include 2 visits to art galleries, 3 classroom workshops for each school, and links the second art gallery visit to National Drawing Day in May 2018. • Monica Munoz is a choreographer and performer, and her project ‘Princesses can be Pirates’ will be a new and innovative dance piece for children aged 6 – 10, working with primary school children from the Docklands area. The piece will be created in collaboration with Dance Ireland, and will be performed in early 2018. • Author Catherine Ann Cullen is collaborating with musician Imogen Gunner on ‘Street Songs and Sea Shanties for the 21st Century’, which aims to forge a new tradition of song-making in the Docklands area by giving the children in two primary schools the tools to collect local stories and ideas and to hone them into communally-written songs. To learn more about the Docklands Arts Fund click here. Andrew Hetherington, Chief Executive, Business to Arts & Garry Ferguson, Managing Partner, Walkers with Olivia Forde, Lexi Forde, Anna Sheehan and James Ferguson at the launch of the Walkers Photographer-in-Residence. 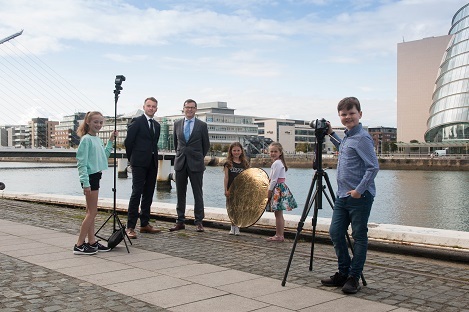 Business to Arts and financial services law firm, Walkers, have today launched a new Photographer-in-Residence programme under the Docklands Arts Fund which will see a photographer work with children and Walkers staff to develop their creativity and photographic skills. The Photographer-in-Residence role will include working with pupils at a local school, participating in photography workshops with young people. The residency supports Business to Arts’ wider programme of activity, which promotes the Arts collaboratively with businesses, artists, audiences and communities. The exciting venture marks the first time that a business in Ireland has engaged a Photographer-in-Residence programme with Business to Arts and Dublin City Council. The selected Photographer-in-Residence will be announced in January 2018. On Friday September 29th, PwC will once again host Business to Arts’ annual CEO Forum. The Forum is a group of over 100 CEO’s from across business and the arts in Ireland who come together each year to discuss new technologies and strategies and share insights from the cultural industries and the wider business sector. The 2017 CEO Forum ‘Seizing opportunities from digital’ will take place on Friday, September 29th and will look at how corporate and cultural institutions use data and digital strategies to grow their businesses, enhance customer experiences and engage differently with respective audiences, users and customers. The panel will examine how digital and technological transformations impact the consumer experience. Participants will look at how this approach applies to business, and how a business can further its engagement with the consumer. Confidence is high amongst Ireland’s arts & business community. Although high levels of digital investment are planned, there is room for improvement in understanding the opportunities presented from digital and upskilling in digital analytics needed. 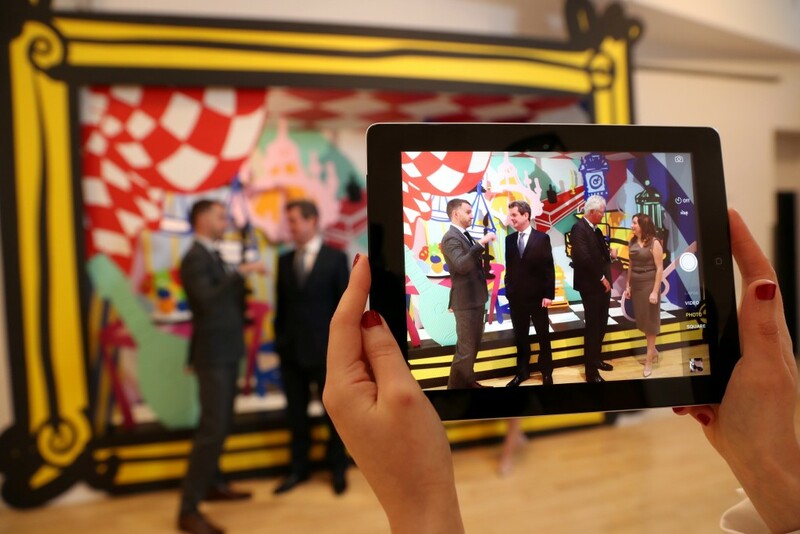 This is according to a new joint PwC/Business to Arts Poll carried out amongst the Business to Arts community aiming to establish a benchmark on investment in digital technologies and the digital opportunities and challenges for this important sector in Ireland. Just one in two (54%) Business & Arts executives with responsibility for the digital strategy highly understand the opportunities presented by the world of digital. This is in line with all Ireland business and technology leaders across all sectors as confirmed in PwC’s 2017 Digital IQ Survey where just half (52%) rate their Digital IQ score as strong, a key measure of the understanding of the value of digital technology. Improving customer experience (42%) is the single key opportunity as a result of enhancing digital offerings. Other opportunities cited by Business & Arts executives are increasing sales (27%) and increasing customer insight (18%). Growing revenues (88%) is the top opportunity for digital investment as seen by Ireland’s business and technology leaders followed by increasing profits (58%) and better customer experiences (42%). We are very happy to support two of our corporate members on a new three-year sponsorship agreement. This week the Irish Times announced that TileStyle have become Associate Partners for The Irish Times Irish Theatre Awards. The partnership will allow the celebration of Irish theatre artists through the annual Awards, which have been run by The Irish Times for over 20 years. 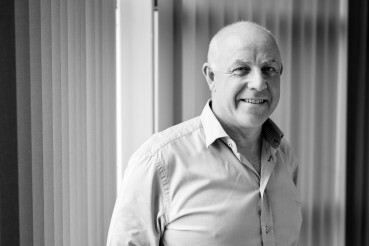 “Design, innovation and creativity are core to TileStyle’s ethos and we align ourselves and our brand with others who share those values,” said Gerard McNaughton, the Retail Director of TileStyle. “The Irish Times Irish Theatre Awards celebrate those very things, talk about them and allow us to take a little time to reflect on them. The winners and nominees of the past twenty years add up to a Who’s Who of the Irish theatre scene and many of those who were recognized when they were up-and-coming have gone on to international acclaim, including Ruth Negga, Tom Vaughan Lawlor, Cillian Murphy, Conleth Hill, Fiona Shaw and Charlie Murphy. Pictured (l-r) at this year’s Allianz Business to Arts Awards were Andrew Hetherington, CEO Business to Arts, Sean McGrath, CEO of Allianz Ireland, Laura Lynch, Head of Segments, Bank of Ireland, Richie Boucher CEO of Bank of Ireland and the Junk Kouture winner, Mariusz Malon (age 18) from Scoil Mhuire Secondary School, Buncrana. Picture Conor McCabe Photography. 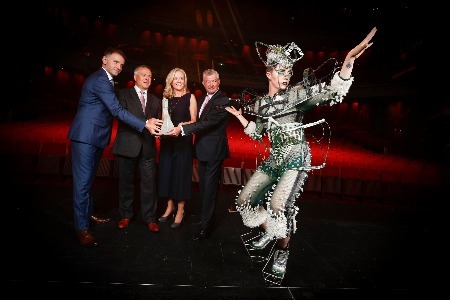 The Dean Dublin, A&L Goodbody, Bank of Ireland, ESB and Dublin Port Company were among the winners in 11 categories at the 26th annual Allianz Business to Arts Awards ceremony at the Bord Gáis Energy Theatre. This year’s Allianz Business to Arts Awards, attracted a record number of nominations with over €6.5m spent on arts sponsorships submitted. The Awards recognise businesses, artists and arts organisations that develop creative partnerships and bring businesses and the arts into mutually beneficial relationships across society. The evening was a celebration of the most innovative and creative partnerships in Ireland in 2016/2017. Leading the congratulations among over 500 business and arts leaders at the theatre was Minister for Finance, Public Expenditure & Reform, Paschal Donohoe TD. 2017 marks the 26th anniversary of the Allianz Business to Arts Awards, which recognise businesses, artists and arts organisations that develop and sustain creative partnerships. The awards recognise large, mid-sized, small and long-term sponsorships, staff engagement activities, commissioning, corporate social responsibility programme, community engagement and portfolio-based partnerships. 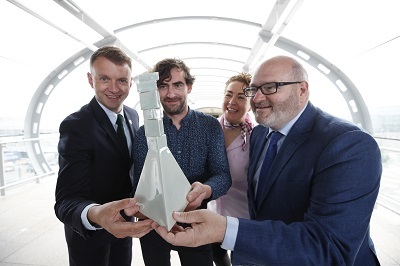 For the 26th anniversary of the Allianz Business to Arts Awards, the awards sculpture once again has been commissioned by daa. This year’s sculpture was created by Cork based artist Kevin Callaghan. Kevin created a beautiful ceramic piece called `Dream Roads’, which is a reference to the potential of togetherness in moving forward with creative ideas. Maurice Ward and Co Ltd is a long established (1968) organization engaged in International Transport and Logistics. In 2008 the Directors, due to their involvement and interest in the Contemporary Visual Arts decided to bolt on a specialist unit engaged in Fine Art Handling and Transport to the larger Maurice Ward international transport company. This Art Handling Unit is headed up by Mary Loughlin, a Director of Maurice Ward. Our primary base of operations is from a modern office /warehouse unit located in Swords, County Dublin. Our location in Shannon serves the West and Mid-West. Mary’s primary business driver was to deliver Tier 1 class standards in packing, handling and transport of Art and to bring our product offering to a standard acceptable at the major Art Hubs in London, New York and to fully respect the art. Maurice Ward has built a great team of Drivers, Technicians, Shipping Coordinators, Customs Experts and International Transport Experts which deliver a wide range of services to Artists, Collectors, Galleries, Corporates, Auction Houses, Heritage Organisations and Museums. 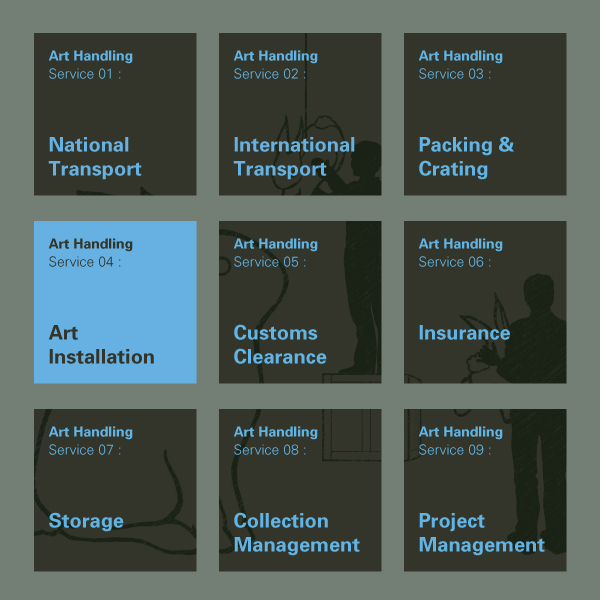 Product Offering: Transport National and International, Packing and Crating, Art Installation, Customs Clearance, Insurance, Storage, Consulting, Project Management and a Specialist Premium Install Service of highly experienced art technicians to install and manage art collections. Accreditations include: ISO Certification, IATA Membership, National and International Haulage Licence, IAA Security Approval, Customs On Line link up, and ICEFAT membership, Correct Insurance Liability, Transit, Employee and Public. Equipment: Modern Fleet ( Mercedes Benz) of GPS Tracked Vehicles with Climate Control, Tail Lifts, Full Art Spec fit-out, ranging from Heavy Goods Vehicles to Sprinter Van type. Fully equipped and secure to transport Art. 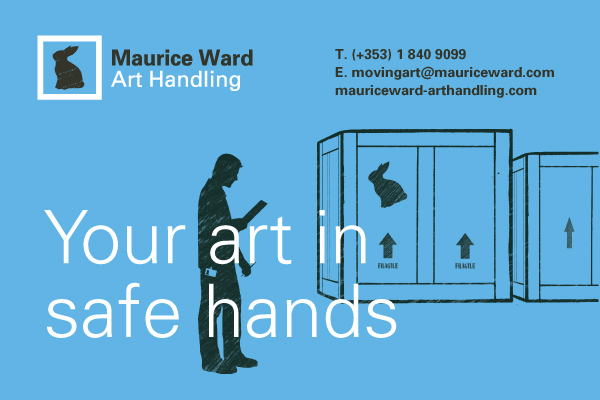 Maurice Ward Art Handling and Transport accreditations and equipment reflect our commitment to delivering a wide ranging world class product offering. 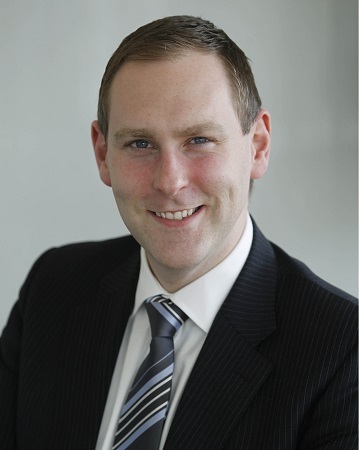 We are very happy to announce the appointment of James Hanley RHA, to the Board of Business to Arts. James Hanley is a Dublin-based painter. An established portrait artist, painting many official and state portraits, he is represented in significant public, corporate and private collections in Ireland and abroad. Born in 1965, he graduated from University College Dublin in 1987 with a degree in History of Art and English, and from the National College of Art &amp; Design in 1991 with a BA in Fine Art Painting. He works in a representational style, in both painting and drawing. He has exhibited extensively in group exhibitions in Ireland and abroad, and has had 11 solo exhibitions. James is a full Member of the Royal Hibernian Academy, was elected to Aosdána in 2008 and elected to the Board of Governors of the National Gallery of Ireland in 2009, where he served 2 terms on the Board. 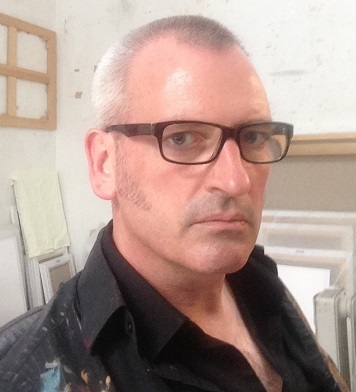 James was Secretary of the Royal Hibernian Academy for 7 years and is currently Keeper of the RHA. He lives and works in Dublin, from a small studio in the city centre and a studio at home on the North Strand. A&L Goodbody Writer in Residence Catherine Ann Cullen and Sinéad Smith, Corporate Responsibility Manager at A&L Goodbody celebrate 1 yr with St. Josephs National School in East Wall showcasing co-created work by 3rd class pupils Kayleigh Kelly, Lexie Carabini and Khizer Inan under the Docklands Arts Fund. The event is part of Dublin’s International Literature Festival ‘Stories from our city’ series. Picture Conor McCabe Photography. 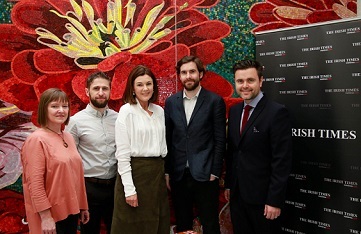 On Monday May 29th, A&L Goodbody & Business to Arts hosted a Writer in Residence event as part of the ‘Stories from our City’ series at Dublin’s International Literature Festival, sponsored by Dublin City Council. Pupils, teachers, family members and A&L Goodbody employees were in attendance to celebrate one year of partnership with the A&L Goodbody Writer in Residence Catherine Ann Cullen under the Docklands Arts Fund at St. Joseph’s Co-Ed Primary School in East Wall. Music and songs composed by the children were performed by the children with Catherine Ann and musician Imogen Gunner. 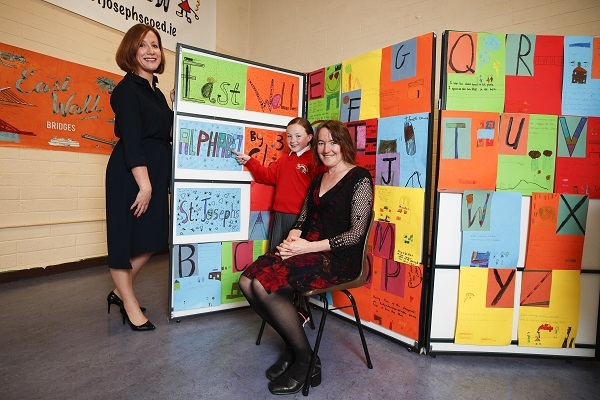 Catherine Ann Cullen has worked with children at St. Joseph’s Co-Ed Primary School in East Wall to develop their creativity and literacy skills. The Writer-in-Residence role has seen Catherine working with pupils, participating in creative writing workshops, encouraging the children to write about their area, their everyday life and their dreams. The venture marks the first time that a business in Ireland has engaged a Writer-in-Residence programme with Business to Arts and Dublin City Council. St. Joseph’s pupils have produced several unique outputs from the residence. 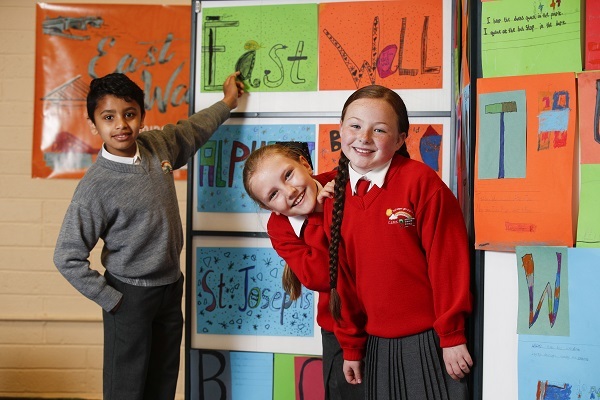 Catherine Ann is focused on connecting the creativity of the pupils with their local East Wall community as well as the wider environment. Some of the outputs to date are the East Wall Alphabet, six songs written together with Catherine Ann, include the ‘East Wall Lullaby’ and ‘East Wall Bridges’ and the ‘Homework Poemwork’ project. If you are a business, organisation or individual based in Dublin’s Docklands and would like to support later phases of the project, please get in touch. We are very happy to announce that Business to Arts are seeking applications for the Docklands Arts Fund Small Grants Scheme 2017 from artists and not-for-profit, charitable & voluntary arts organisations. The objective of the grant round is to contribute funds to a range of artists and arts organisations working in the Dublin Docklands Area. Approximately 3 grants of a maximum of €5,000 each will be given to projects by September 2017. The Open Call for Projects is live until Thursday, 29th June 2017 at 5pm. Projects that will take place between September 2017 and June 2018. 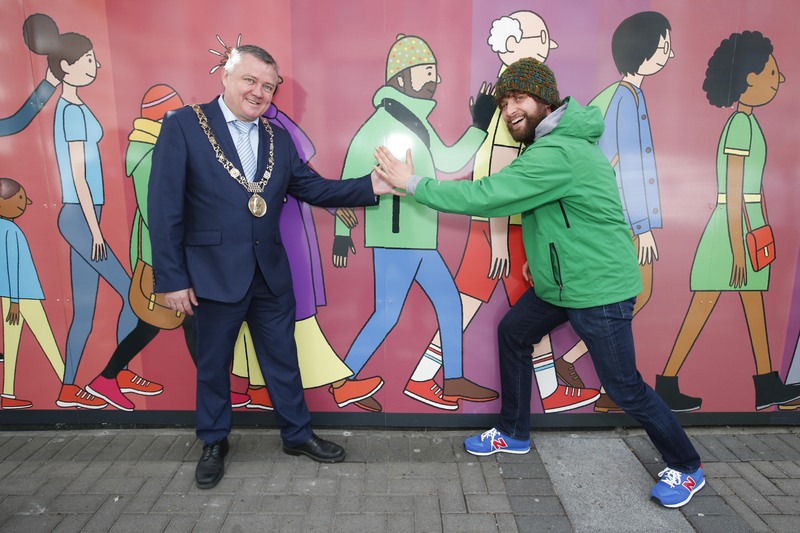 The Lord Mayor of Dublin Brendan Carr unveiled the 120 foot long ‘Draw Me Docklands’ mural by the award winning artist and illustrator Chris Judge on Dublin City Council’s Docklands Office, Custom House Quay on Tuesday, 2nd May 2017. Chris Judge Said “I was delighted to be one of a number of artists asked to pitch on this unique project and was then thrilled to win it. It is such a wonderful opportunity to create something special for this part of the Docklands so it was a huge honour that the teams in Business to Arts and Dublin Docklands chose me as I was aware my idea was a little ambitious. #DrawMeDocklands is a Dublin City Council funded project in collaboration with Business to Arts and the Docklands Arts Fund project. If you are a business, organisation or individual based in Dublin’s Docklands and would like to support the Docklands Arts Fund, please get in touch. 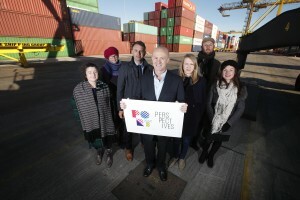 Pictured (l-r) at Dublin Port are the first Port Perspectives artists commissioned to create public artworks, Cliona Harmey, Sheelagh Broderick, Business to Arts CEO Andrew Hetherington, Dublin Port CEO Eamonn O’Reilly, Alice Butler, Daniel Fitzpatrick, Silvia Loeffler. Business to Arts and Dublin Port Company today announced the artists commissioned to create a series of site-specific public artworks in response to Dublin Port and its relationship with the City. 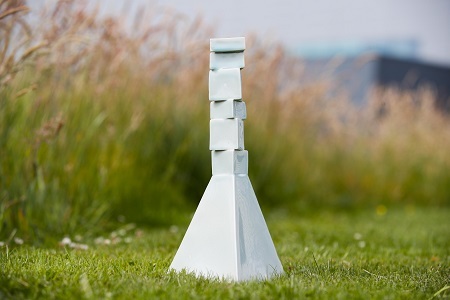 New works by Sheelagh Broderick, Silvia Loeffler and AEMI & Cliona Harmey will be unveiled at sites and on structures within Dublin Port over the coming months. This is the latest development from Port Perspectives, Dublin Port’s arts commissioning series for 2017, aimed at strengthening the bond between Dublin Port and the City and bringing Dublin Port to new audiences through the arts. First is Sheelagh Broderick’s ‘Great Wall Walks’, which looks to create a link between Dublin Port Workers and Dublin Port Walkers, i.e. between those who work at the Port and those who use its environs for recreational purposes. Based at the new Seafarers’ Centre on Alexandra Road, international seafarers arriving at Dublin Port will be invited to collaborate with Sheelagh on creating a series of audio guides to their home towns and cities. The audio will be available to download and highlighted to walkers on the Great South Wall, encouraging local walkers to connect with the world of the international port worker. Launching on May 1st, Sheelagh’s project brings an inclusive and international dimension to the series, celebrating multi-culturalism and social diversity at the heart of port life. An accompanying event will follow on International Seafarers’ Day (June 25th). Meanwhile, the work of Silvia Loeffler will unfold in a number of phases during the summer. Silvia Loeffler’s ‘Transit Gateway: A Deep Mapping of Dublin Port’ will document the transitional changes in the shape of Dublin Port, from its medieval shoreline to modern day configuration. In collaboration with partners and the local community, Silvia will work for the next nine months on artistic cartography to show the changing connections of the city and how the port has acted as a gateway, creating a vital connection for the city with the wider world. Her work will go on display in the Terminal 1 building at Dublin Port, and a seminar will be held each month to mirror the nine phases of the mapping process. The seminars will take place in the last week of each month at the LAB Gallery on Foley Street, Dublin 2 and places can be booked online through Eventbrite. In September, audiences can look forward to AEMI & Cliona Harmey’s ‘port | river| city’. This project will research and co-curate a season of artist, experimental, and archive moving-image artworks that interrogate and reflect on ports and their environs. Their collaborative project comprises a series of cinematic screenings as well as site-specific installations across a number of strategically chosen locations in the city. With the use of a mobile field cinema, audiences can expect screenings from early September for a three-week period. Today marks the launch of the 2017 Allianz Business to Arts Awards Call for Nominations. Both Allianz and Business to Arts are highlighting the unique opportunities that business engagement with the arts provides and are encouraging businesses and arts partners across Ireland to share their creative partnership stories. This year marks the 26th anniversary of the Allianz Business to Arts Awards and Allianz’s 17th anniversary of involvement and sponsorship of the awards. The success of the Awards has developed considerably over recent years and with economic growth set to continue, there is even greater opportunity for further partnership between business and the arts. A new online application system has been devised to accommodate the ever increasing entries received. “We are always honored to be associated with the Business to Arts Awards. We believe that both businesses and the arts community benefit tremendously from collaborating and working together. The partnership inspires creativity, promotes understanding and enhances the presence of businesses in the wider communities that they serve. “The Allianz Business to Arts Awards identify and celebrate best practice creative partnerships between business and the arts. It is fantastic to witness the increasing creativity, innovation and hard-work demonstrated by the various nominations from all over Ireland. Closing date for applications is Monday, May 8th 2017 at 5pm. Click here for information on the entry process and to complete the online entry form. Today we launch the first phase of our search for individuals interested in participating in the Fundraising Fellowship, Dublin programme in partnership with Dublin City Council’s Dublin’s Culture Connects. Four selected cultural organisations will recruit for new Fundraising or Marketing & Fundraising Executives to participate in the programme. All recruited Fellows will be required to participate in what is a new and very exciting initiative, from April 2017 until March 2019. This will require the Fellow’s attendance at various workshops, training, and mentoring sessions with Business to Arts and our partners. Details relating to Dublin Theatre Festival & Temple Bar Gallery + Studios will be released at a later date.